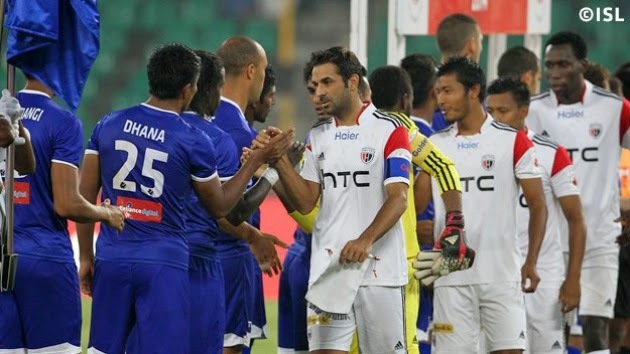 Chennaiyin FC and NorthEast United FC were involved in a thrilling 2-2 draw in a Hero Indian Super League match at the Jawaharlal Nehru Stadium in Chennai tonight. The hosts thought that they had the three points wrapped up when Elano Blumer scored his second goal of the evening in the 78th minute after he had put his side in the lead in the 25th minute. But Koke came up with a stunning equaliser in the 85th minute to ensure a division of points. Earlier, Seiminlen Doungel had helped the visitors draw level in the 38th minute with a sweetly timed volley to ensure the two sides crossed over on level terms.